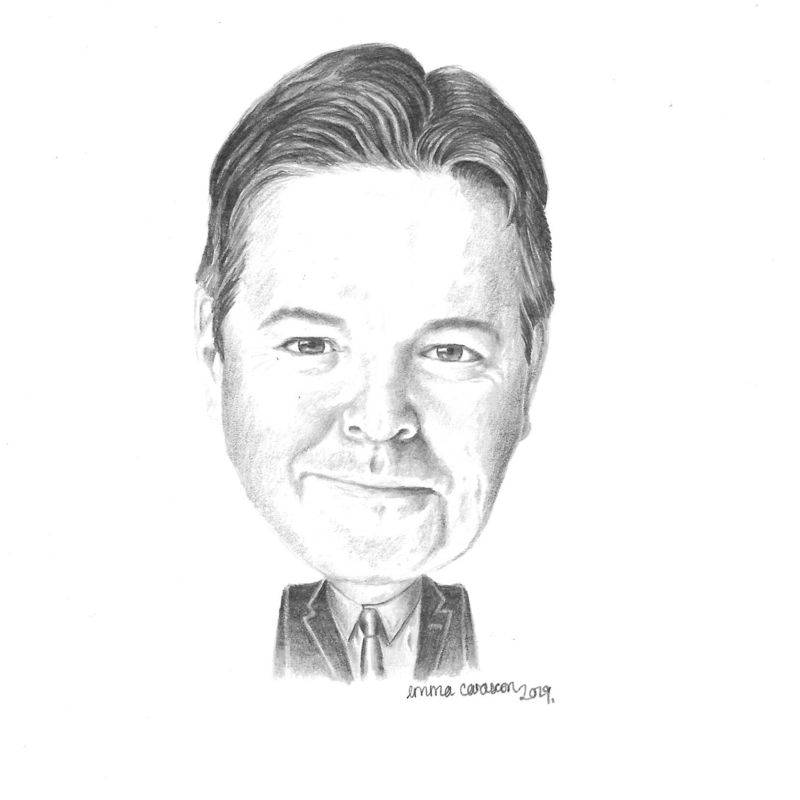 Karma Network | Rockwell Shah on Calm: "If they execute well, it's...massively undervalued." Rockwell Shah on Calm: "If they execute well, it's...massively undervalued." Humans rely on apps for everything. But what first started out as tools for work or increasing efficiency, have now turned into tools for exactly the opposite: winding down, relaxation, and even getting quality shut-eye. A strong competitor in the wellness tech space, Pzizz, promises to alleviate insomnia the world over by delivering sleep at the push of a button. Utilizing psychoacoustics, Pzizz creates sequences of sound tailored to various portions of your sleep cycle to promote mindfulness meditation, progressive muscle relaxation, changes in heart rates, and more. Pzizz is a company that reached profitability just 30 days after its launch, according to CEO Rockwell Shah. Shah says there is a lot of room to grow in the market. After all, the Global Wellness Institute pegs the the wellness industry’s value at $4.2 trillion and increasing at a rate of nearly twice that of overall global economic growth. 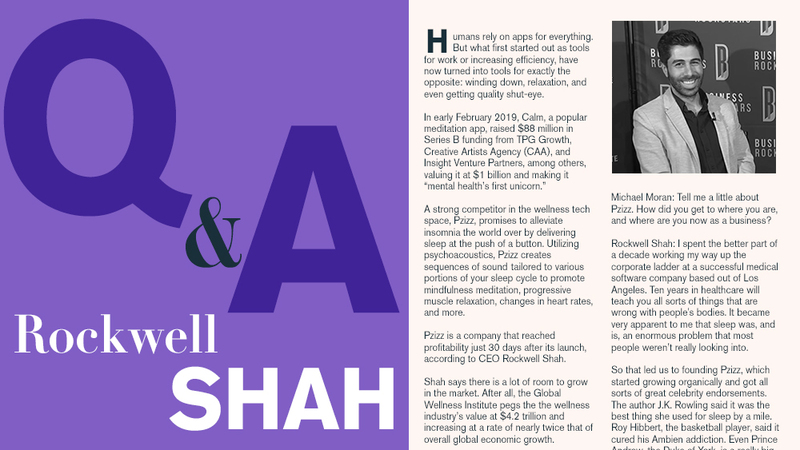 In this interview with Karma Network's Contributing Editor Michael Moran, Shah shares his insights into why parts of the wellness side of healthcare have been overlooked and may still be undervalued, and tells us why content is king even in the health-tech space. Michael Moran: Tell me a little about Pzizz. How did you get to where you are, and where are you now as a business? Rockwell Shah: I spent the better part of a decade working my way up the corporate ladder at a successful medical software company based out of Los Angeles. Ten years in healthcare will teach you all sorts of things that are wrong with people's bodies. It became very apparent to me that sleep was, and is, an enormous problem that most people weren’t really looking into. So that led us to founding Pzizz, which started growing organically and got all sorts of great celebrity endorsements. The author J.K. Rowling said it was the best thing she used for sleep by a mile. Roy Hibbert, the basketball player, said it cured his Ambien addiction. Even Prince Andrew, the Duke of York, is a really big Pzizzer. We hit profitability about 30 days after launching, so funding never was a problem after our seed round. We raised about $500,000 in early 2016. We went through the startup accelerator called Wyra that's based out of central London. Now, you know, we've rebranded and have all sorts of partnerships and deals in the B2B space. Most of our business is B2C, but we have a deal in the U.K. for the National Health Service’s digital apps library. So patients can actually walk into their doctor’s office and say, “Hey, I'm having insomnia,” and the doctor can prescribe them Pzizz. We had to go through all sorts of hurdles and obstacles to get that distinction, but it's great that we have it. Michael Moran: So you’ve found your own success, and now you see Calm raising an $88 million Series B round from some pretty big names like CAA and Ashton Kutcher’s Sound Ventures. Is this the coming-of-age of this space, or is this just a another step forward? Shah: This is just the beginning. When we talk about how big the market is for health and well-being, it’s an absolutely enormous number. Think of how mental health affects healthcare: The ramifications of constantly being in an overstressed, overworked, overanxious, deficient of nutrition, deficient of exercise, environment have enormous implications for our overall health and well-being. When people people look at Calm and say it's worth a billion dollars, is that overvalued? My opinion is, if they execute well, it's undervalued. It's massively undervalued. Michael Moran: Why do you think a talent agency like CAA would want to invest in a meditation app like Calm? Is it because Calm’s focus is on being a content library? Shah: It's very clear why CAA would want to invest: because this business is driven by talent. Especially for Calm, but also for us, you need very talented musicians, composers, narrators, and scriptwriters to pull this kind of content off. This is a combination of science and art. There are many studies on how to write the perfect pop song, but you can’t just read a scientific paper and then expect to become as successful as Beyoncé. There is a certain amount of art and an X-factor that you need to pull off this kind of business, and I think that's why CAA is interested. Michael Moran: Do you think about the space being driven by technology? It’s now “app-ified” obviously. Is that a box that you have to break out of? Shah: When technology first started getting into the wellness market it was all about tracking things that can measure your health. And this was not necessarily a critical mistake, but this was a distraction. You can see that play out with how how most of the tracker companies went: either belly up or bought out for pennies on the dollar. There's a graveyard that's littered with tracker companies because when engineers try to solve very human problems, they often miss the most important details. Engineers really miss that nobody wants to be told that they're too fat, or that they're too slow, or that they don't walk enough. That's really what the first-and second-generation trackers did. I think that was a very unproductive use of time, because people are not looking for fancy dashboards and information. They're looking for solutions, and very few companies actually offered solutions. So as that developed, there was a concurrent push for digital therapeutics. But what happened is most of these companies and these products were driven by people that didn't really know how to make consumer products. They were PhD students and scientists — people who knew a lot about the therapeutic side of things but didn't know a lot about customer behavior, user behavior, UX, UI, or how to create habit-hooking mechanics. This is part of the reason that VCs thought everybody was crazy in this space. They looked at things like retention and sales, thenthought, “Well this stuff just doesn't really work. It is not really worth investing and it's not going to be a big business.” But now, Calm and many other companies like it have demonstrated how wrong that thinking is on so many levels. Michael Moran: How does your business model compare to Calm’s and those of other competitors? What advantage does yours have? Shah: In terms of our business model, it's the same: it's a subscription (model). But in terms of what differentiates us as a business? — Calm is incredible at marketing They are absolutely phenomenal marketers. Their product is also, in terms of the quality of the content, great. They have achieved, and I say this in a very kind way, a sort of McDonald’s-ization of meditation. And that's amazing because it brings something to the mainstream that wasn't there before. Where I think that they don't quite have the vision that we have is with how technology improves the effectiveness of the content. Calm looks at themselves as a library of content, so all of the things I've talked about, including personalization of thoughts, and personalization of biometrics, are not things that Calm is focused on. But we look at ourselves more as a health-tech company and a solution provider. There's also another distinction in terms of the perspective of how we can create content. We are very much about evidence-based research, so we have somebody full-time that reads and translates all the academic and clinical literature for the rest of our team to help product design, product focus, and content design. This really makes an enormous difference to the effectiveness of our content. Calm does great things with their adult bedtime stories, and that certainly has a place in the market. But if you're having really strong problems with your chronic back-pain condition, you're going to need a different intervention than an adult bedtime story.